Are you Alice? Limited Edition Privilege Drama CD "All in the golden afternoon" / Are you Alice?限定版特典ドラマCD「All in the golden afternoon」 / Are you Alice? 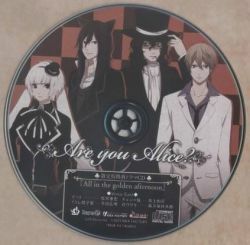 Limited Edition Privilege Drama CD "All in the golden afternoon"
Are you Alice? Limited Edition Privilege Drama CD "All in the golden afternoon"
Comes with the Book & CD Set 'All in the golden afternoon' of the limited edition.